In November 2018, a group of visitors from Laos found themselves in a forest in Liberia, learning how the country’s forestry officials track timber through the supply chain. A few days later they got to do the same in Ghana. Their visits — and that of a team from Republic of the Congo to Ghana — were made in the context of trade deals called Voluntary Partnership Agreements (VPAs) that all four countries are engaged in with the EU. While Laos is still negotiating its VPA, the other three countries are implementing theirs and have made varying degrees of progress. Ultimately, each aims to be able to assure buyers that its timber products are legal. With much in common despite their differences, these countries are sharing important lessons about how to address illegality in the forest sector and promote legal timber trade. The Laotian delegation included representatives of government agencies responsible for forestry, timber processing and trade in timber, as well as the private sector and civil society organisations. They travelled first to Liberia, which ratified its VPA with the EU in 2013 and has since been developing the systems needed to control, verify and license legal timber and timber products. From 21-25 November 2018, they visited Liberia’s Forestry Development Authority (FDA), where they held fruitful discussions with the departments responsible for verifying legality and issuing export permits. The Lao team also visited a forest concession area and a timber yard where it observed the chain of custody system in action. Delegations from Laos and the Republic of the Congo visit a saw mill in Ghana’s Sefwi Wiawso District. 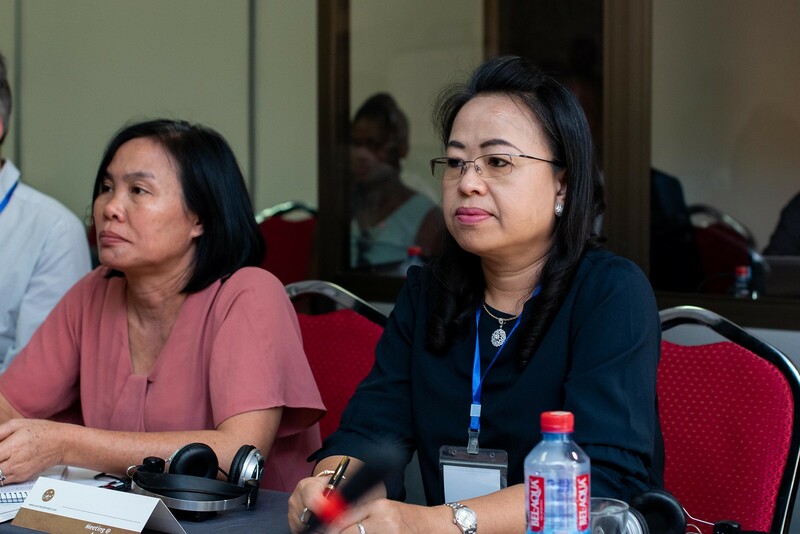 'As Liberia has already negotiated a VPA with the EU and is now implementing the Agreement, it can provide us with valuable experiences and lessons learned,' said Khamfeua Sirivongs, the head of the Lao FLEGT Standing Office, which coordinates the country’s VPA negotiations with the EU. Mike Doryen, Managing Director of the FDA, thanked the Lao delegation for its eagerness to visit and learn from Liberia’s example. He said he hoped the delegation would 'harvest the fruit of the systems, procedures and institutional arrangements Liberia has put in place'. The Lao delegation then travelled to Ghana, which is at an advanced stage of VPA implementation ahead of FLEGT licensing. There, they joined a team from the Republic of the Congo, which has been implementing a VPA since 2013. At a two-day conference hosted by Ghana’s Forestry Commission, participants from the three countries shared progress from their respective VPA processes. Staff from the Forestry Commission then provided an overview of the timber legality assurance system Ghana has developed under the VPA. They gave presentations on topics including legality verification protocols, electronic wood tracking, the roles of civil society and the work of the Timber Validation Department and Timber Validation Committee. The visitors from Laos and the Republic of the Congo then travelled to Sefwi Wiawso District, where they learned about the Forestry Commission’s district level operations. They then visited a logging concession and a sawmill to observer how Ghana’s wood tracking system applies at harvesting and processing sites. They also visited another sawmill to see the challenges small and medium enterprises face in demonstrating legal compliance. Delegations from Laos and the Republic of the Congo at a logging concession in Ghana’s Sefwi Wiawso District. Learn more about the VPA processes in Ghana, Laos, Liberia and the Republic of the Congo.